APA encourages educators, community organizations, and planning practitioners across the country to embrace youth engagement in planning. Young people form a large and important segment of the population and they have a substantial stake in planning the built environment. Although they may not have a planner's vocabulary, they recognize the effects of planning on their lives. Their unique perspectives are valuable contributions to planning conversations. APA invites educators to use the resources on this page to learn about youth participation in planning and to engage students directly with the tools provided. In a short essay for educators and students, Cynthia Bowen, FAICP, provides a thoughtful and accessible introduction to the planning profession. With support from APA, a citywide civic education initiative by the Chicago Architecture Foundation helps teens and young adults understand what makes a good neighborhood. Central to this "Meet Your City" project is a graphic novel, No Small Plans. 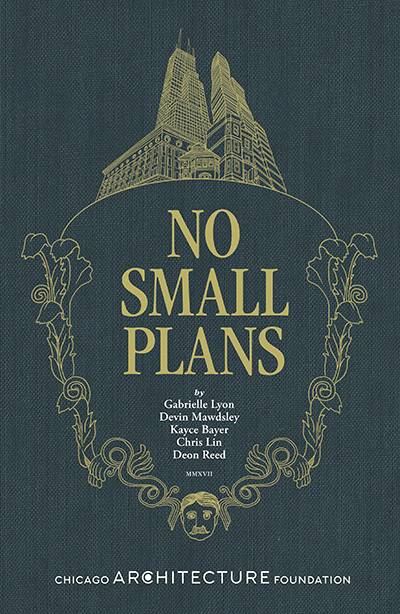 Use CAF's Reader Toolkit to explore the themes, characters and settings featured in No Small Plans. Annotated chapter guides — along with resources and activities — help readers act on issues presented in the book on their own, with a friend, or in a classroom. A green CITY OF YOUR OWN! 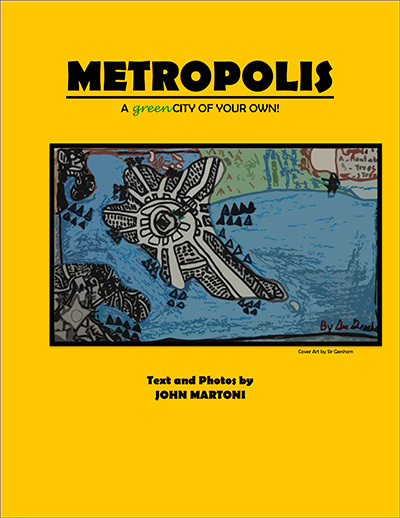 Metropolis is a curriculum developed by John Martoni, a third-grade teacher and planner. It is a standards-based, interdisciplinary unit of study for grades three through six, but it could be adapted for any grade level. Elementary classroom teachers and other adults can use its text and many illustrations and exercises to expose children to a variety of urban forms from around the world. The city elements presented — edges, districts, public spaces, landmarks, and transportation — provide organizing mechanisms for children to design their own ideal cities. How much do youth really know about the place where they live? How much do the young people in your town know about the place where they live? Every community is special and has a story to tell. 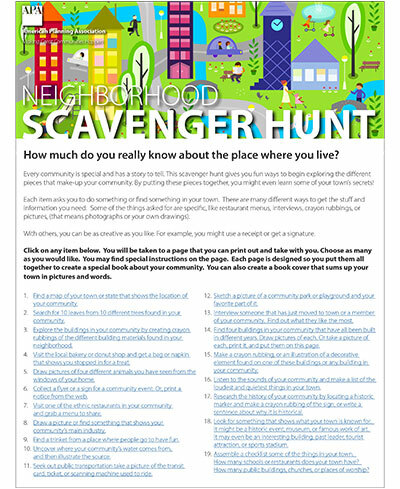 This Neighborhood Scavenger Hunt offers fun ways to begin exploring the different pieces that make up a community. Each item on the list poses a question, requires participants to accomplish a task, or asks them to find something in their town. There are many different ways to procure requested objects and information. Some items are set, like restaurant menus, interviews, crayon rubbings, and pictures (photographs or students' drawings), while the instructor creates others. Meet some APA planners and find out why they chose planning, how they got to their current positions, and how they serve their communities day-to-day. Would you like an APA Ambassador to bring an interactive lesson or activity about planning to the students in your classroom? Learn about the Ambassadors program, planning summer camps, and other resources to help you pique your students' interest in the many ways planning affects their community.